The United States’, along with other states’ armed forces have become increasingly reliant on Unmanned Aerial Vehicles (UAVs). UAVs have been used extensively in Iraq and Afghanistan and the trend toward employing improved robotics technology and unmanned systems is likely to continue in the near future. Seated in front of video screens thousands of miles from the theatre of operations, sensor operators and pilots remotely control UAVs by way of a games console or keyboard. Increasingly powerful cameras provide them with good optical pictures of individuals on the ground. The image resolution is high enough to distinguish between a man and a woman. After launching a missile, at the end of their shift, military personnel involved in these operations go home to their families. High tech, it seems, has brought the reality of war closer to home again. From the perspective of International Humanitarian Law, this is preferable to high altitude bombing insofar as this technology should allow an attacker to better verify whether a target is in fact a military objective and to assess expected incidental loss of civilian lives more accurately. It also makes war more real and less impersonal for the attacker, a change in perception that may mitigate the dehumanization of the opponent so common in today’s conflicts. Yet, this has nothing to do with the chivalrous concept of face-to-face combat that underlies many of our modern-time rules of warfare – after all, the victim hardly shares the attacker’s sense of proximity. As to the visualization of weapons effects, both the Ottawa Process leading to the Anti-Personnel Mine Ban Convention and the Oslo Process on Cluster Munitions testify to the powerful impact of images on people’s minds. These processes were successful not least because survivors and campaigners effectively and graphically communicated the impact that mines and cluster munitions have on people. This has led some cynics to observe that only weapons that have recently caused a humanitarian catastrophe can now successfully be banned. The 1995 Protocol on Blinding Laser Weapons (Protocol IV to the Convention on Certain Conventional Weapons) is evidence to the contrary. Blinding lasers were banned before they were ever deployed. Hopefully, we will not have to witness with our own eyes the effects of all emerging weapons technologies before we bring ourselves to outlaw at least those that cause superfluous injury, unnecessary suffering or affect civilians and combatants without discrimination. Photo credit: "Help" by lette_applejuice on Flickr. -- On 15 August, the NGO Human Rights Watch reported on Russian use of cluster munitions in Georgia, after it identified strikes on Gori and Ruisi on August 12 that it said killed at least 11 civilians and injured dozens more. -- On the same day, according to the Cluster Munitions Coalition of NGOs, the Defence Minister of Norway - the country that has spearheaded international efforts to ban cluster munitions and that will host, on December 3, a signing ceremony for the new Convention on Cluster Munitions - expressed grave concern at Russia’s alleged use of cluster munitions. -- On 19 August, the Russian Ambassador to the Conference on Disarmament in Geneva accused Georgia of using cluster munitions against South Ossetian civilians and Russian peacekeepers. -- On 21 August (yesterday), Human Rights Watch rejected Russia's denial that it had used cluster munition, saying that it had documented additional Russian cluster munitions attacks during the conflict in Georgia. -- Also yesterday, the Irish Foreign Minister, who hosted the diplomatic conference in Dublin in May of this year at which 107 States (although not Russia or Georgia) adopted a new treaty banning cluster munitions, expressed "deep concern" over allegations that cluster bombs were used by Russian forces. Media coverage of the use of cluster munitions in Georgia has been extensive and the public outcry has been loud. The Cluster Munitions Coalition has organised protests and vigils outside of Russian embassies around the world. 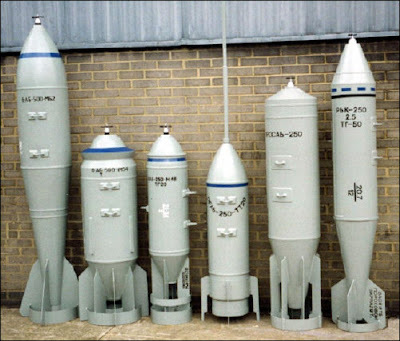 Photo Credit: A group of aerial bombs as depicted on the website of Miltra Engineering Ltd. The cluster munition that Russia is accused of using in Georgia - the RBK-250 - is on the far right. S/he makes a good point. Certainly, the Oslo Process on cluster munitions, like the Ottawa Process on anti-personnel mines before it, is a clear demonstration of a significant grouping of States (1) losing patience with inadequate or non-existent progress on pressing humanitarian issues and (2) deciding to go outside of the framework of the United Nations in order to achieve collective security goals. The success of these processes has indeed brought home to many disarmament diplomats that 'progress is possible' even if more traditional routes seem to be blocked. However, it may also have some other, unforeseen effects on multilateral disarmament diplomacy within the United Nations. Many of the States that participated in the Oslo Process and that adopted the new Convention on Cluster Munitions (CCM) in Dublin in May were nevertheless uncomfortable with having to move outside of UN structures to achieve results. Given the choice, they would have preferred to achieve the same result in the UN. Despite its success, therefore, there is not much appetite for moving outside of the UN in order to overcome obstacles in other areas of disarmament and arms control unless these have very clear and tangible benefits. On the contrary, it would seem that the Oslo Process experience, generally speaking, has actually made States more committed to making progress on disarmament and arms control within UN structures. As such, the Oslo Process has strengthened the UN, not undermined it. It's shaken things up by demonstrating that there are alternatives to traditional processes and that, if the UN wishes to remain relevant in disarmament and arms control, it must deliver results that demonstrably improve state and human security. So, what does 'consensus' mean? According to the Oxford English Dictionary it means "general agreement or concord." Dictionary.com prefers "majority of opinion." So, the first thing to understand, obviously, is that consensus is not the same as unanimity, where absolutely everyone is in agreement. The concept of consensus encompasses the possibility of disagreement. Consensus means that almost all parties agree. This (and in my view correct) understanding of consensus has been largely overshadowed in disarmament diplomacy by an interpretation that equates consensus with unanimity, thereby granting de facto veto power to every party to a negotiation. What's more, some States have become so used - or, indeed, addicted - to wielding veto power that they no longer think twice about blocking progress that is obviously desired by most, or even all, other UN Member States. One of the perhaps unintended consequences of the success of the Oslo Process is that this overly restrictive interpretation of consensus is now being reconsidered. The concept of consensus is perhaps finally being rehabilitated and put in its proper context. A clear illustration of this is the vote that took place at the end of the 3rd Biennial Meeting of States to monitor implementation of the UN Programme of Action on small arms and light weapons (see "UN small arms process 'back on track'"). In that instance, Iran was the only hold-out on an agreement to move the UN small arms process forward. A few years ago, Iran's action might have scuppered the possibility of an agreement. This time, the many other States that wanted an agreement did not shy away from voting to settle the issue. In the end, Iran, joined by Zimbabwe, decided to abstain from voting. All other States present and voting (134 in all) voted in favour and the agreement passed. This is how the consensus mechanism should work. If this new way of working becomes more widely applied to disarmament and arms control negotiations, we may well see more progress being made, albeit with some States deciding to opt out. And the need to make progress in disarmament and arms control is, I think, something on which we can all agree. 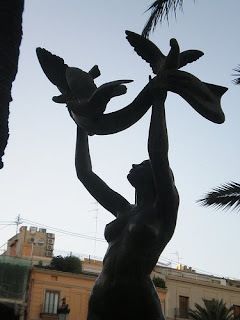 Photo Credit: José Puche's 1998 'Monumento a la Paz y a la Concordia' (Monument to Peace and Agreement), Plaza de la Vírgen, Valencia, Spain. Photo by henneorla on Flickr. On Wednesday, the world commemorated the 63rd anniversary of the atomic bombing of Hiroshima. In some earlier posts on this blog, we discussed reappraisal of the utility of using nuclear weapons on Japan and its flow-on effects, including post hoc rationalization about huge weapons programmes like the Manhattan Project to build the Hiroshima and Nagasaki bombs (like: otherwise there would have been a million or more American casualties invading Japan, apparently), and the subsequent Cold War nuclear arms race. It was also observed that moral arguments for nuclear disarmament or those based on the costs to civilians are - despite their importance - often pooh-poohed by the so-called realists. I was therefore intrigued to read Frank Gaffney's opinion editorial in Tuesday's Washington Times entitled 'Dangerous Disarmers'. To put it politely, I thought Gaffney's op-ed was more than a little daft, seriously out of touch and out of date - fitting the above-mentioned pooh-pooh category with a nice splat. Gaffney was upset, he said, because he felt he'd been ambushed by Japanese television in what he described as a "propaganda-fest" filmed by NHK last weekend on nuclear abolition. Maybe Gaffney is right: I haven't seen the film. But I am acquainted with NHK TV film crews, and it's hard to feel threatened by almost invariably bright, petite, impeccably-made up Japanese female journalists and frantic looking production people lugging huge heavy-looking Sony camera bags from gig to gig like hamsters on speed. "Sadly, as the NHK program made clear, the campaign to eliminate nuclear weapons - heretofore a hobbyhorse of the radical left and its Soviet [sic] handlers - has now taken on a unprecedented degree of respectability. Prominently featured in the taping was a clip lionizing former Secretary of State Henry Kissinger. Thanks to two op-ed articles he co-authored in the Wall Street Journal urging a nuclear-free world, Mr. Kissinger has been transformed in the eyes of the anti-nuke crowd from a "war criminal" into a sage and inspiration." Well, I don't know about that - however, maybe can he tell me where the Soviets have been all these years? Meanwhile, do I detect any sour grapes in that little sideswipe at Big H.K.? I mean, I think that's Doctor Kissinger to you and me. Gaffney continues by saying that "As a result, many who do - or certainly should - know better, have begun to embrace the idea that we can safely and responsibly effect the global elimination of nuclear weapons. Some, like Barack Obama, appear intent on doing so forthwith. In what passes for prudence, John McCain says it is a long-term goal." The NPT is a good thing to you and me, but not to Gaffney. To him, the NPT has failed and resulted in the dissemination of nuclear-weapons relevant technology. Perversely, Pakistan's A.Q. Khan nuclear smuggling network is a result of the NPT (although Pakistan is not a member) and North Korea - "the world's 'Nukes-R-Us'" is also the treaty's fault. Oh good grief. It's clear Gaffney isn't a believer in nuclear disarmament. Fair enough - that's his prerogative. But he needs a better set of arguments to support his point-of-view. His op-ed rolls out the same old tired, boiler-plate clichés with which everyone is familiar, and which have been comprehensively dealt with by bodies like the WMD Commission : the nuclear genie is out of the bottle; others won't abide by agreements they make with the US to disarm; Pakistan, Iran and North Korea aren't nice people, and a number of these states "have ties to terrorists" and - my favourite - "history shows that, in the absence of nuclear deterrence, the world would eventually be plunged yet again into the sort of cataclysm that twice scarred the 20th century". You mean, before humankind invented - in the course of the second of these conflicts - the means to annihilate everyone on the planet many hundreds of times over, as opposed to conventional conflicts killing tens of millions? ""You can't have this kind of war," Eisenhower concluded. "There just aren't enough bulldozers to scrape the bodies off the streets. " It followed, and follows, that there is no military solution to safety in the nuclear age: There are only political solutions. 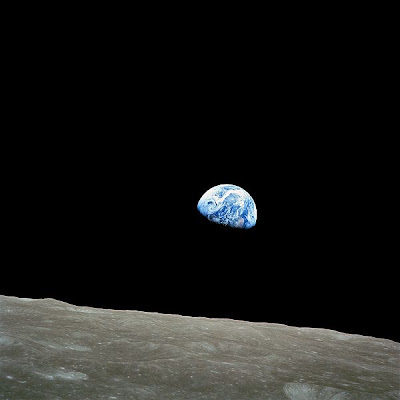 As the Danish physicist and philosopher Niels Bohr summarized the dilemma succinctly for a friend in 1948, "We are in an entirely new situation that cannot be resolved by war." The impossibility of resolving militarily the new situation that knowledge of how to release nuclear energy imposes on the world is the reason the efforts on both sides look so desperate and irrational: They are built on what philosophers call a category mistake, an assumption that nuclear explosives are military weapons in any meaningful sense of the term, and that a sufficient quantity of such weapons can make us secure. They are not, and cannot." Meanwhile, the US Government has been quietly getting on with reducing the size of its nuclear stockpile. According to a recent fact sheet by the International Institute for Strategic Studies (IISS) (do they have Soviet handlers too? Surely not), announced nuclear reductions by President George W. Bush will leave its stockpile at about a quarter of the size it was at the end of the Cold War. There have also been sharp Russian reductions, although comparable data isn't available. Nevertheless, long after Frank Gaffney and others have passed on to their conservative think-tanks in the sky (where there just might be a few Soviets waiting to greet them), the rest of us will be living with the appalling risks of nuclear warfare because one-quarter of Cold War stockpiles is still not zero. In his op-ed, Gaffney appears to contend that we should thank nuclear weapons for stability during the Cold War. That is highly debatable, and we certainly have nothing to thank them for in today's world. IISS Strategic Comments: 'The US-Russian nuclear balance: New treaty needed' (Volume 14 Issue 06, August 2006). 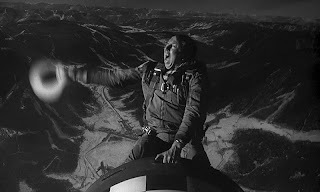 Picture credit: Slim Pickens riding the bomb, from Dr. Strangelove or: How I Learned to Stop Worrying and Love the Bomb (1964), downloaded from Wikipedia. 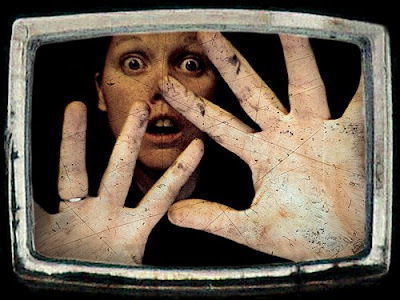 # It illustrates an educational article about the entity that the picture depicts. # The image is used as the primary means of visual identification of the article topic. # It is a low resolution image, and thus not suitable for production of counterfeit goods. # The logo is not used in such a way that a reader would be confused into believing that the article is written or authorized by the owner of the logo. 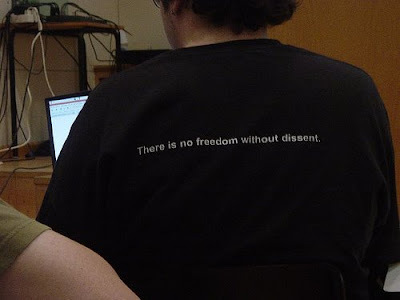 # It is not replaceable with an uncopyrighted or freely copyrighted image of comparable educational value. After the end of the judicial recess on 18 August, the trial of Charles Ghankay Taylor, former President of the Republic of Liberia, will resume before the Special Court for Sierra Leone (SCSL). Taylor is charged with 11 counts of crimes against humanity, war crimes, and other serious violations of international humanitarian law in connection with his alleged role as backer of the rebel group Revolutionary United Front (RUF) during the armed conflict in Sierra Leone in the late 1990s. Why is this of interest to a disarmament-related blog? Because the indictment bases Taylor’s individual criminal responsibility not only on his alleged participation in the crimes by planning, instigating and ordering them, but also on the grounds that he allegedly aided and abetted their perpetration by providing financial support, military training, personnel, and arms and ammunition to the RUF. This raises interesting questions about the individual legal responsibility of all persons involved in arms transfers. A Dutch court recently heard an appeal in a case that is remarkable in that the accused was not only charged with violating the Dutch regulations banning arms exports to Liberia (2001 Liberian sanctions regulations), but also for violating the laws and practices of war by, among other things, deliberately aiding and abetting in the commission of war crimes through the sale or supply of weapons to Charles Taylor. The Taylor trial is possibly the first international criminal trial where the supply of arms could constitute a separate legal basis for individual criminal responsibility. As to the question of criminal liability of persons, the distinction between legal and illegal arms trade, as described above, is not central, although any supply of arms to the RUF would have been in breach of the arms embargo imposed by the UN Security Council and national laws enacted pursuant to it. Rather, what matters for the establishment of individual criminal responsibility under international law are what the supplied arms are used for, and the connection between the supplier and the user. 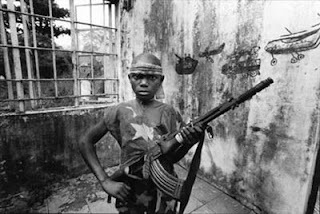 In accordance with the Rome Statute of the International Criminal Court, an arms supplier could be held criminally liable for facilitating the commission of a war crime, by aiding or abetting, including providing the means for its commission. To incur liability, the supplier would have to provide arms intentionally, and in the awareness that in the ordinary course of events, this will facilitate the commission of a war crime. In the Dutch case cited above the accused was acquitted for lack of evidence. This serves to illustrate the difficulty of establishing the intent and knowledge requirements beyond doubt. As the Canadian Ministry of Foreign Affairs and International Trade has recognized, the issues highlighted by developments like Taylor’s indictment are of interest to other “high government and military officials engaged in the authorization of arms transfers” and will have to be considered at some stage in the process leading to an Arms Trade Treaty. If it compels arms exporting authorities to be more cautious, this is probably a good thing. Maya Brehm. Maya has joined UNIDIR as a researcher.